The Las Vegas Aviators celebrated their home debut with a blowout victory over the Sacramento River Cats Tuesday night. LAS VEGAS (KTNV) — The Las Vegas Aviators faced the Sacramento River Cats in their home opener at the new Las Vegas Ballpark in Downtown Summerlin. "Let's go! Let's go! Las Vegas Aviators!" said fan Mike Hughes. Fans were pleased that the Aviators hit a home run before the first pitch even left the pitcher's mound. Aviator and Spruce the Goose were also in attendance as the new mascots. Hailey Dawson, 9, from Henderson made history again Tuesday night. Using her 3D-printed prosthetic hand, she's already thrown out the first pitch at all 30 Major League baseball stadiums, and she captured fans' hearts here. The national anthem was even followed by a flyover from Nellis Air Force base. The wild winds that blew through Southern Nevada all day Tuesday somehow went hand in hand with the Aviators' "Fly with Us" theme. "We didn't come prepared at all. I ran into the store to grab the last two sweatshirts," said Sheryl LaFontaine, a season ticket holder. "The branding is cool, and the color scheme is new, and it's vibrant, and it's alive, and it pays homage to Howard Hughes, who was an iconic figure in the development of Las Vegas," Don Logan, the president of the Aviators, said. 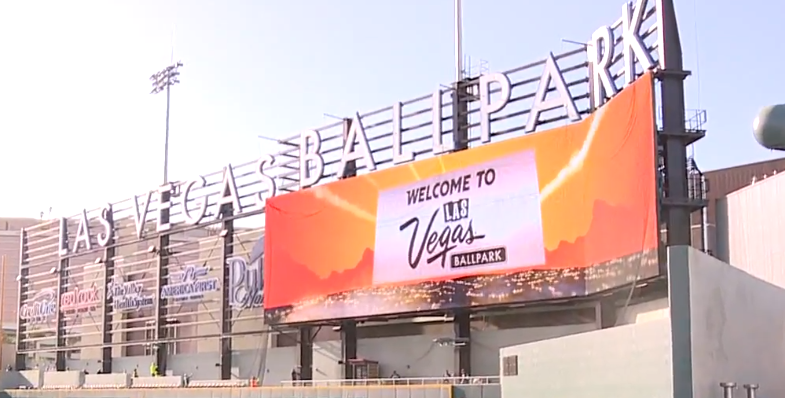 According to the Howard Hughes Corporation, the Las Vegas Ballpark was "designed to create a festival-like atmosphere in Downtown Summerlin," as the eight-acre site is designed to complement the master planned community. The sold-out crowd's final attendance was 11,036, according to the team, and the Aviators won 10 to 2. The seven-game homestead wraps up April 15.